I have only sadness and pity in my heart for Fred Phelps and the church he started. If the name sounds familiar, but you cannot place it, Fred Phelps is the man who beget the Westboro Baptist Church (WBC). The church that makes those of us who follow Jesus cringe. The church that causes non-believers to turn away from Christianity. I feel no anger, no hatred, because I understand the simple yet profound truth that if they do not allow the God who loves us to transform their hearts they will never experience the eternal life that Christ so nobly and courageously gave us. God loves the world – not just some of us. He wants all of us to have a relationship with Him, not just some of us. Jesus welcomed sinners and soldiers and tax collectors into his fold. He was their Shepherd, not their accuser. He loved them and taught them and healed them; he didn’t picket at their funerals. We are all sinners in our own way. Those of us who have allowed the love of Jesus to transform us have an understanding of the grace given to us. We have an understanding that we didn’t deserve it. Christ freed us from the desire to hate or judge. He freed us to love and include. He freed us to extend a hand of compassion, just as he did throughout his ministry. The members of WBC sadly remain in the captivity of their own hatred. The fact that Jesus asked us not to judge requires me not to judge Fred Phelps. It requires me not to desire picketers at his funeral. It requires me to pray that he has a change of heart, that he asks forgiveness, along with the people he influenced and caused to stumble along the way. 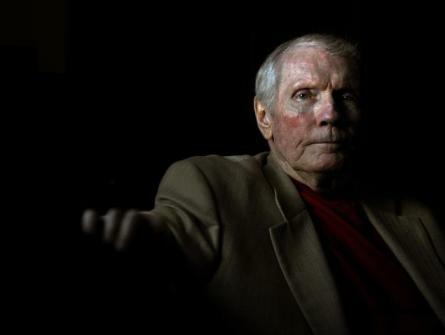 Heavenly Father, I pray for your son Fred Phelps. I lift him up to You before he suffers a permanent death. I pray that he sees You for who You are – a God who loves everyone, who calls all creation to Himself. I pray that his followers also become thirsty for You, Lord, and begin to ask forgiveness for their hatred. I pray they open their hearts to You one by one, that they experience Your love, grace and mercy in a way that fills them and changes them. I pray they offer this same love, grace and mercy to others as a reflection of their change and Your light in them. I ask all who read this to pray this prayer. I lift this prayer in love, in Jesus’ name. We that think this way… seem to be in a minority of even Christ Folliwers in this. You love God’s love here. I wrote on this similarly and received hate comments … first time ever. It’s sad. No winder the world speaks the way they do about Christians … the majority the world sees are not showing this kind of grace. Blessings as you walk this out. Thank you, Heather. I’m so sorry you received hate comments; these are not brothers and sisters in Christ. Yet, we must pray for these, too, because I’m convinced that underneath the hate is hurt. I think that was the case with Phelps – deep, soul-piercing hurt that caused him to choose to run from God instead of toward Him. Sadly, I’ve found sometimes these hate filled remarks are from those who claim Christ. Sometimes they disguise it “don’t judge or tell me what to do” type statements when we are merely stating our own personal stance. I am glad I am forgiving now in my life and that I do not have to determine their heart condition. What a hard job God has! I mean by that… it must hurt Him worse than it hurts me. I like your praying attitude. You are for sure a sister in Christ! Thank you so much, Heather. Wait until tomorrow’s blog. Can’t wait to see the comments on that one! Pray for me! Beautiful written. Hearing about some of the things he did and encouraged others to do in the name of Jesus Christ is quite distressing. I recall reading through ‘A Purpose Driven Life’ by Rick Warren and there is some discussion about forgiving and loving those even when they behave quite badly. I mostly related to that in terms of people I was directly in relationships with, however the same principles apply generally speaking. Thank you…and we all are a work in progress. ❤ back. i was surprised to hear of his past…how he was a civil rights attorney who once fought against injustices to the oppressed…fought against injustices to minorities who had less of a voice…and how he and his family even endured a lot of criticism and harshness for their efforts…i wonder what changed, but definitely prayed he accepted God’s absolute LOVE…absolute grace….the awesome pursuit of God…i pray He died in peace, not with hatred blinding his view of such a magnificent God. Very sad the things we do when we walk away from God. I pray that he returned to his Father, too. You have more compassion and generosity of spirit than most in this world – in the face of this I will lay aside the previously comforting idea of this man burning in the hell that he so tried to condemn others to. I will endeavour to offer prayers to my lady that he has learnt much about hatred and bigotry in this life and now with those lessons learned he can return to be one of those who work against such, until such a time as he has completed his evolution on the spiritual wheel and returns to the seat of knowledge becoming one with the universe and all who inhabit it. You are a good person – and I will endeavour to emulate your example. Oh, don’t emulate my example, Jenni. I’m only human. If you want to emulate someone, please emulate the example of Jesus. He’s the one I strive to follow, though fall far short. I guess I meant I admire your ability to hold on to all that is good in your faith in Jesus. It is rare as so many wish to judge too easily. Thank you, Jenni. It is difficult at times, but I do my very best. Bless you. His diatribe concerning our liberties and the hatred he espoused for our servicemen and women were dismaying to me. I understood the reasoning behind people trying to ban the protests of him and his church, but their rhetoric was also a source of discomfort. However, I do not blame him nor do I blame those who tried to censure him and his church. Rather, I blame the less than responsible behavior of the media. The reverend might not have succeeded in his crusade had the media been predisposed to good judgement and ignored him and his church. However, even as he has departed, another will surely take his place and we will all have to endure yet another round of attacks while the media will report every ugly incident with vigor and a seeming incredulity. Just plainly disgusting. I agree that media has played a role, and understand your dismay. Behind the media coverage are individuals making decisions, so I pray for them as well. Yes, he will have followers and so will the decision makers in media who worship ratings and money. But those of us who pray for love and unity are many in number, and many will come after us as well. I wish nor celebrate no death of any of my enemies. This man was a great enemy of people like me but I hope he passes in peace. I also hope that one day the future Fred Phelps, whoever those people may be, learn indifference through love and not through picketing and anger. I understand and appreciate your heart. Thank you for your thoughtful comment. Amen! I’ll pray too my friend! Thank you so much. We must turn the world around with love. Once again you have brought me to my knees with your words of wisdom. 3 of my 5 brothers are in the military, and so I have been judging him. Thank you for the gift of perception that you share with my heart today. I too will join you in prayer for his heart. Thank you and bless you. I offer a prayer for your three brothers, that they are blessed and surrounded by love, and that they are kept safe under the wings of God. Very powerful. Very moving. Amen. Thank you, and thanks as always for the visit. Susan, I commend you on the willingness to pray for those who are the hardest to feel compassion for, like F.Phelps and his followers. Sometimes I think we, as believers, have to ask Jesus to change in us that which causes us not to want to pray for those like this man and his followers. Sometimes I try to pray for those who have caused me trouble, who are my enemies, and the words stick to my lips and my mouth goes dry and I feel like a hypocrite praying while I am in the wrong frame of heart/mind. I know that I do not have to like these people or what they stand for in order to pray for them. I just have to love …which is not a ooey, gooey, feeling but rather, an obedience to our Lord Jesus who was our example. If He can pray for forgiveness for those who crucified him, then I can most certainly pray for those who are against me, too. You’re so right, Dale. It’s not about loving him in that way. It’s about wanting in our heart what God wants, making His desires our own. I am certain, like the lost son in the parable, God would welcome him home. We need to be not like the elder son who judges and stews in our anger, but forgiving and welcoming, praying that the lost sons and daughters will return to the arms of our loving Father. Even if those lost sons and daughters have done harm to us, if they “see the error of their ways,” and come home they will be prevented from harming so many others. Thank you, Karina. I know this may be difficult for some, but I know he has it in him to lead others to God’s heart.